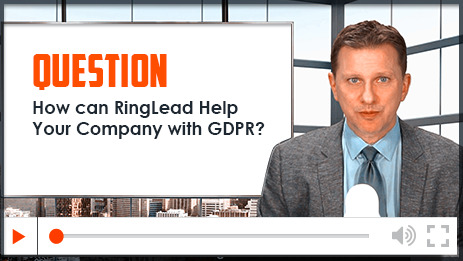 GDPR: Getting Data Privacy Ready - RingLead, Inc. Imagine meeting someone on a train who happens to know a guy who is a perfect fit to help you close a business deal. What if it might be illegal for you to call or email him? Do you write down the phone number and email address anyway? Will Europe sue you for $24 million? GDPR is empowering people to take control of their own personal information. People have always expected, and deserved, the right to block calls, be removed from mailing lists, and not receive spam emails. Yet data is more available now, than ever before, and the right to protect your own data is more complicated than ever. So, how can you sell if you can’t contact people? What happened to the door-to-door encyclopedia salesman? Clearly, Wikipedia burned that opportunity. But, with so much technology and in-your-face marketing and sales campaigns, aren’t marketers more invasive now than in the past? That’s why we have the CAN-SPAM Act to force businesses to comply with anti-spam laws, and the national Do Not Call Registry to force businesses to comply with cold-calling privacy laws. How can a business comply with these laws, yet still market and sell? Everyone wants to share information. Business people want to network. Partners want to share customers. People want to learn about new products. And yes, companies do buy lists of people and get referrals from partners. But now companies need to comply with GDPR. How can I get in front of GDPR? Fortunately, it is possible for companies to adhere to the privacy laws, like the national Do Not Call List requirements, and still acquire phone numbers. Companies can gather email addresses and comply to the CAN-SPAM Act. More Importantly, companies can even be GDPR compliant while reaching out to new prospects. What if you could confirm that phone numbers and email addresses were legal for you to both call or email, even before you save the data? You can. The door-to-door salesman just needs a little technology; like the ability to delete any person’s address from their mobile device containing the list of addresses. Third party data vendors, which add personal data, can be filtered and flagged for your marketing and sales departments to comply with privacy laws. If you identify new contacts, and log where their personal data was obtained, you can document the data permissioning and prepare for deleting the data, if requested. Before dialing any new phone numbers, or better yet, even before the numbers are entered into your CRM, have a process in place to implement an automated procedure to check if the phone number is on the Do Not Call list. In contrast to the national Do Not Call Registry, GDPR does not have a similar registry, and instead has its own set of requirements. In addition to securing your data, which contains personal information, GDPR requires companies have effective processes and procedures for Europeans to demand “to be forgotten”, and delete all traces of personal information. GDPR also requires all companies to work closely with their third-party data vendors to ensure that procedures are in place in order to comply with these laws. Technologies, like RingLead DMS Enrichment, can help companies comply with privacy laws by only sourcing verified contact data, like direct dials, mobile numbers and email addresses, for any persons. DMS Enrichment allows you to gain valuable insights on customers, prospects and leads with validated and enriched company and contact data, to help increase connection and conversion rates. My next blog on GDPR, Third Party Vendors, will help you confirm and investigate any third-party vendor with whom you share personal information. Next Blog: Email me at Steve@RingLead.com or follow me on Twitter to be updated on my next blog post.